What Else (Besides the Syllabus) Should Students Learn in Introductory Physics? The following resolution was passed unanimously at the Institute Faculty Meeting on October 15, 2009. It is with great sorrow that we regretfully acknowledge the sudden death of our friend and colleague, Dr. David Schauer, on June 7, 2009 – one day after his 48th birthday. David Schauer was known not only for his keen scientific mind, but also as a friend whose empathy and compassion touched countless individuals. David's warm personality and gentle nature evoked a sense of genuine trust and caring. His students loved him for his openness, unpretentious manner, and ability to sit down with them to discuss research projects, or talk about personal issues or life in general. This appreciation is shared by the many colleagues he interacted with not only here at MIT but also those more widely at the national and international level. David was born in New York but spent his youth in North Carolina, where he graduated with honors in biology from the University of North Carolina in 1983. He was then accepted into the School of Veterinary Medicine at North Carolina State University. He chose this career path after being counseled by a research veterinarian and mentor, Dr. James Pick, who convinced David that a veterinary education would allow David to establish solid foundations in science and comparative biology. Indicative of David's passion for science, he undertook laboratory research during his veterinary education with Dr. Paul Orndorff, professor of veterinary microbiology, and published his first two first-authored papers while in Dr. Orndorff's laboratory. He graduated with a doctorate in veterinary medicine in 1987, and then after a year’s experience in private practice joined the laboratory of Dr. Stanley Falkow at Stanford University to gain a doctorate in microbiology and immunology. Dr. Falkow considers the publications resulting from David's research on Citrobacter rodentium as seminal contributions on the role of microbes in inflammatory bowel disease and colon cancer. Following completion of this work, David was recruited to MIT in 1993 as an assistant professor in the Division of Comparative Medicine and the Division of Toxicology, transitioning in 1998 into what is now the Department of Biological Engineering. In 1999 he was promoted to associate professor, and four years ago he became a full professor. Along the way, David became increasingly involved with undergraduate and graduate education at MIT, both in the Biological Engineering Department and institute-wide. He served on the MIT Undergraduate Curriculum Committee as chairman, and helped establish a new interdepartmental program in microbiology in 2007, as co-director, with Alan Grossman of the Biology Department. David will be long remembered as a gifted and dedicated teacher both to undergraduate and graduate students at MIT, and additionally at the Chulabhorn Graduate Institute in Bangkok, Thailand, where he taught during a number of summers. 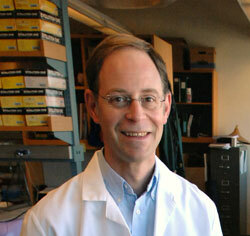 David's research was supported on a continuous basis by the National Institutes of Health throughout his career at MIT. His studies on microbial pathogenesis of gastrointestinal pathogenic bacteria, particularly Citrobacter rodentium, a murine model of enteropathogenic Escherichia coli, and enterohepatic helicobacter are widely known and respected. Along with his scientific contributions, David’s personal interactions as a mentor and collaborator in his research program have had significant impact. Dr. Vince Young, now on the faculty at the University of Michigan, joined David's laboratory for a postdoctoral fellowship in infectious disease. Vince credits the training he received under David's supervision as his primary motivation to focus his research on the microbial ecology of the gastrointestinal tract. As Vince describes, David remained a steadfast friend and was readily available for advice, “which was always useful and always cheerfully given.” Dr. John Leong, a professor at the University of Massachusetts Medical School, was a collaborator and friend. He describes David's genuine interest in the work of others in the field and his innovative approach to environmental health problems on a global scale. Dr. Scooter Holcombe, currently a staff veterinarian and immunologist at Massachusetts General Hospital, was David's classmate in veterinary school and a close friend for 25 years, who also echoes these sentiments. Scooter fondly remembers David's sense of humor and intense focus, whether in the laboratory or relaxing with sports activities. Dr. Schauer's membership on the Gastrointestinal Mucosal Pathobiology Study Section exemplifies the esteem in which David was held by his colleagues. Dr. Richard Peek, a professor at Vanderbilt University and a co-member of this study section, recalls that David “exuded enthusiasm, integrity, and vigor for his work as well as the work of others.” David also served on the editorial board of several journals and as a scientific reviewer for many others. His colleagues at MIT and his collaborators throughout the world also valued his keen scientific insights and, importantly, his friendship. David's family and his Jewish faith were the center of his personal life. Along with Carol, his wife of 25 years, he was the proud father of two sons, Nathan and Sam, both young adults; Nathan is a sophomore in college, and Sam is a recent high school graduate. The family resided in Newton, Massachusetts, and was actively involved in their temple. David introduced his sons to the Young Judea Summer Camps and the 9-month Young Judea Program in Israel, where he and Carol had first started dating. In addition to participating in a variety of sports including intramurals with our graduate students, David relished the outdoors and always eagerly anticipated camping trips with his family and bike treks with his wife in Europe and Asia. David is survived by his mother, Francine (Ross) Schauer of Scottsdale, Arizona, and 2 brothers: James of Madison, Wisconsin, and Andrew of Denver, Colorado. We will miss and remember David in many ways, each of us with special thoughts of his warm, gentle spirit, his openness to others' views and ideas, and most importantly how he embraced life, both personally and scientifically, and deeply appreciated its boundless opportunities. BE IT RESOLVED: THAT THE FACULTY OF THE MASSACHUSETTS INSTITUTE OF TECHNOLOGY, AT ITS MEETING OF OCTOBER 21ST 2009, RECORD ITS PROFOUND SENSE OF LOSS ON THE DEATH OF OUR BELOVED COLLEAGUE AND FRIEND, DAVID B. SCHAUER, AND EXPRESS ITS DEEPEST SYMPATHY TO THE SCHAUER FAMILY.